Li made the statement when addressing a welcoming dinner party organized by the Economic Club of New York, the National Committee on U.S.-China Relations, and the U.S.-China Business Council. 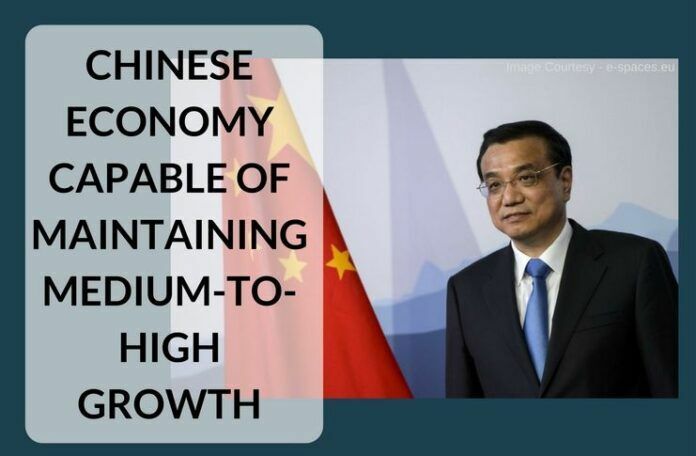 Chinese premier Li Keqiang said on late Tuesday that the Chinese economy needs and is capable of maintaining medium-to-high growth rate. [dropcap color=”#008040″ boxed=”yes” boxed_radius=”8px” class=”” id=””]L[/dropcap]i made the statement when addressing a welcoming dinner party organized by the Economic Club of New York, the National Committee on U.S.-China Relations, and the U.S.-China Business Council. Faced with weak global economic recovery and waves of geopolitical conflicts, no country can stay immune to these unstable and uncertain factors, Li, who is here for a series of United Nations conferences and engagement with a wide spectrum of Americans, told about 1,000 elites of American business. China’s economy, which has been deeply integrated into the world, is slowing down, but still maintains stable growth, at an annual rate of 6.7 percent for the first half this year, which is not easy for an economy that has reached 10 trillion U.S. dollars, he said. With an annual growth rate of 6 percent to 7 percent, China’s economy each year can add the volume equivalent to a medium-sized economy, Li added. [dropcap color=”#008040″ boxed=”yes” boxed_radius=”8px” class=”” id=””]T[/dropcap]he Chinese economy still needs to grow at medium-to-high rates, because every year there are 14 million extra population of labor force in urban areas and China also needs to wage war on poverty which is still plaguing over 50 million Chinese people, the premier said. China is capable of maintaining this medium-to-high growth rate, thanks to its ongoing efforts to restructure and upgrade its economy and the emergence of new growth driving forces and dynamics, Li reassured the audience. The great achievements China made in over three decades in the past is attributable to reform and opening up, which is still crucial for today’s economic restructuring and upgrading, said the premier. The gathering came one day after the premier met with U.S. President Barack Obama in New York, during which Li called for concerted efforts to promote economic and trade ties between the world’s top two economies. Economic and trade cooperation is the “cornerstone” and “propeller” of the China-U.S. relations, Li said during their talks. [dropcap color=”#008040″ boxed=”yes” boxed_radius=”8px” class=”” id=””]E[/dropcap]nhancing China-U.S. cooperation is in accord with the fundamental interests of the two peoples and the common wish of the world community, he said, while expressing China’s willingness to deepen bilateral, regional and global cooperation in various fields. Obama, for his part, reiterated that his country supports China’s reform process and hopes that the two sides can make further progress in bilateral investment treaty negotiations. Li is scheduled to attend the general debate of the 71st session of the UN General Assembly on Wednesday before heading to Canada to continue his overseas trip, which will also take him to Cuba. Previous articleCan India’s ‘Pradhan Sewak’ tune in to ‘Mann Ki Baat’ of ‘Aam Admi’ and punish Pakistan?